This summer, a group of undergraduate students has teamed up with CABBI researchers to pursue an ambitious research project. 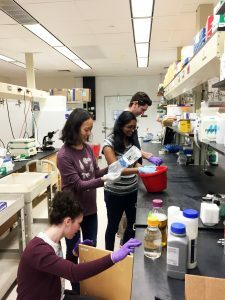 Their work is in preparation for the International Genetically Engineered Machine (iGEM) competition, which brings together undergraduate students from across the world to present their research in synthetic biology and compete for prizes. This year’s team from the University of Illinois at Urbana-Champaign is made up of five students: Pranathi Karumanchi, Ziyu Wang, Liam Healy, Amie Bott, and Alexander Ruzicka. Their project is funded by the CABBI, a collaboration between the Institute for Sustainability, Energy, and Environment (iSEE) and the Carl R. Woese Institute for Genomic Biology (IGB) that aims to develop sustainable biofuels and bioproducts. The iGEM team is mentored by graduate and postdoctoral researchers Carl Schultz, Shekhar Mishra, and Matthew Waugh, IGB Outreach Activities Manager Courtney Fenlon, CABBI Program Manager Elizabeth Murphy, and Associate Professor of Bioengineering and CABBI scientist Ting Lu. The idea for the team’s project came from the joint work of Ting Lu and Yong-Su Jin, a Professor of Food Science and Human Nutrition and CABBI scientist. Lu is researching lactic acid bacteria, which is used in the production of cheese and yogurt, while Jin studies baker’s yeast, which is used in baking bread. Lu and Jin want to see what a collaboration between these two organisms could achieve in the field of metabolic engineering. 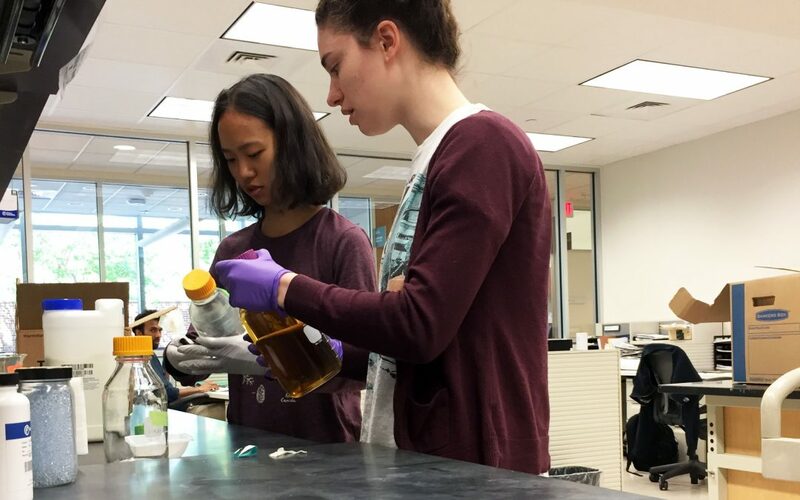 The iGEM team is continuing this work; it will study how lactic acid bacteria and baker’s yeast work together, testing different environments and food sources. Team members will then engineer the organisms to see if they are capable of creating a valuable product. One of the biggest challenges the team faces is the lack of prior research in this area. Team members have had to troubleshoot how to make an environment that would help the organisms grow together. “Because there’s not a lot of literature to go on, right from the early stages, this project has been one of inquiry,” Mishra said. Despite the trial and error involved in the research, the mentors said the team has made quick progress this summer. “They’re making some discoveries that — as far as we can tell — haven’t been made so far in literature, in terms of how to actually grow these two organisms together in such a way that they’re both able to grow healthily,” Schultz said. Lu said the upside of the project is that any discoveries and progresses will be new to the field. The team will present its work at this year’s iGEM competition in October.